Do you remember Shovel Knight, that retro action platformer with a virtually flawless formula? 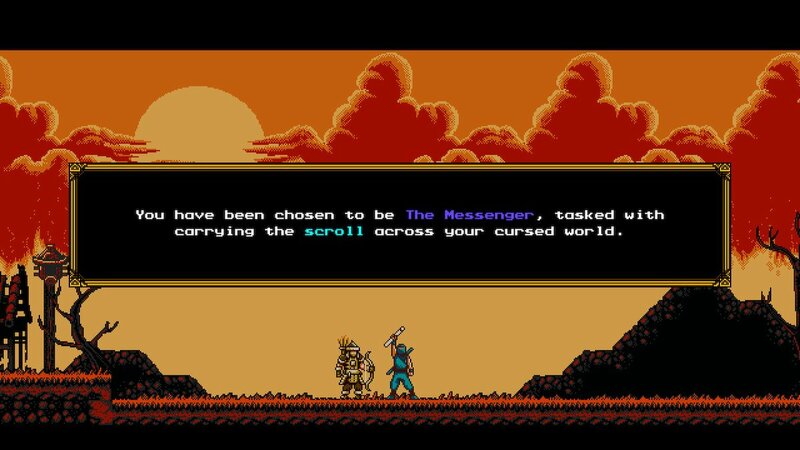 Meet The Messenger, the latest retro platformer to impress players with its near-perfect design. 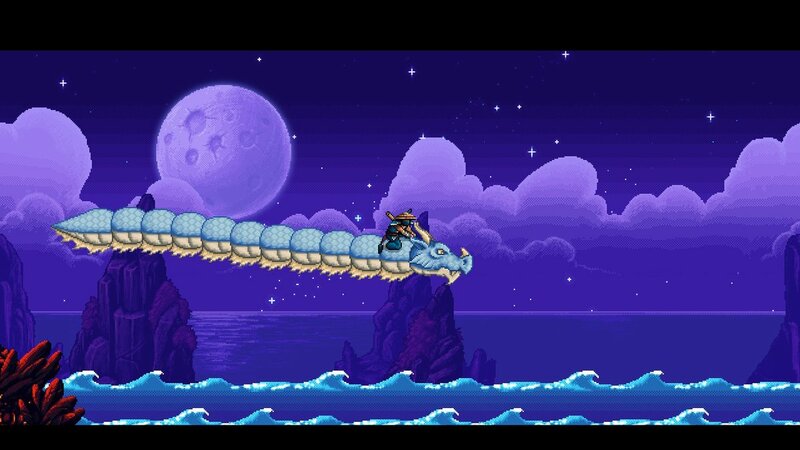 But The Messenger is more than a simple platformer. Around mid-game, this indie morphs into a time-traveling metroidvania, shifting between 8-bit and 16-bit graphical styles to represent different periods in time. The Messenger is unlike any game we’ve ever encountered, and we’re excited to share our thoughts with you. 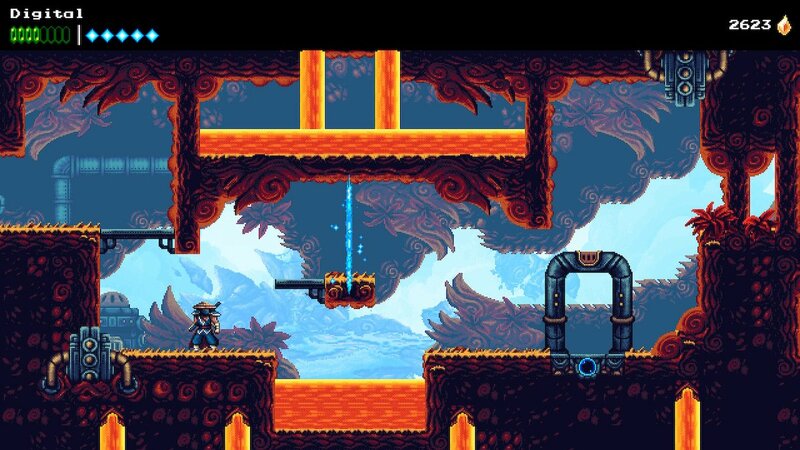 Let’s take a closer look at The Messenger, our current indie obsession. Meet The Messenger, our current indie obsession. The game’s eponymous character is a young ninja who just wants to see the world. But he’s stuck in his village, training in preparation for a possible demon attack. Such an attack seems impossible to the young man, so he resents his training and clashes with his trainer, a village elder. But just as he’s fighting with the elder over the probability of an invasion, a fiery demon army surrounds his village. The village and its inhabitants are destroyed as the elder laments that the “western hero” did not save them. Soon after, the “western hero” arrives, finding the young ninja as the lone survivor. The “western hero” gives the young man a sacred scroll, instructing him to take it to the summit of a glacial peak, where three sages await. The young ninja becomes The Messenger. Journey through more than a dozen unique worlds. Here’s an example of 8-bit graphics in The Messenger. 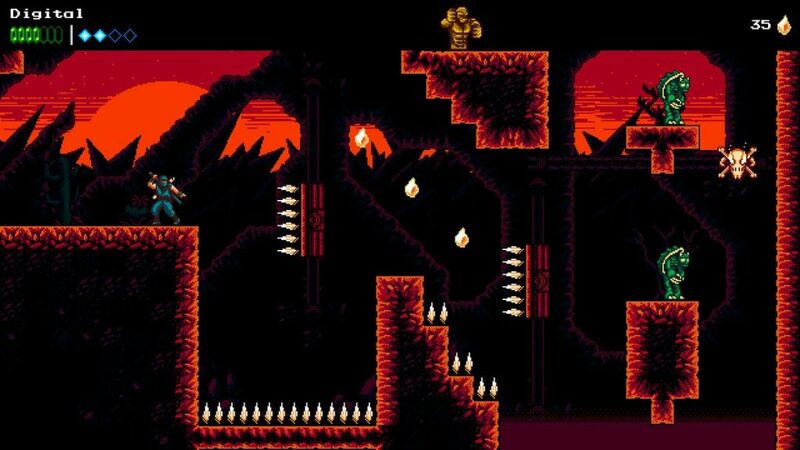 The Messenger offers plenty of fierce platforming challenges, so you’re guaranteed to die, and you’ll likely die often. But you don’t have to worry about losing lives, and you won’t be charged time shards for dying, either. Instead, when you die, a sarcastic and grumpy creature named Quarble comes to the rescue. After rescuing you, Quarble hangs around, collecting each shard you harvest until paid in full for saving your life. 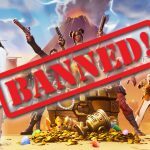 In our experience, it doesn’t take long to collect enough time shards to appease Quarble, and it’s nice to see a fresh alternative to the “lives and continues” system that actually works. Quarble might be a little grumpy. But Quarble never fails to rescue you in your time of need! 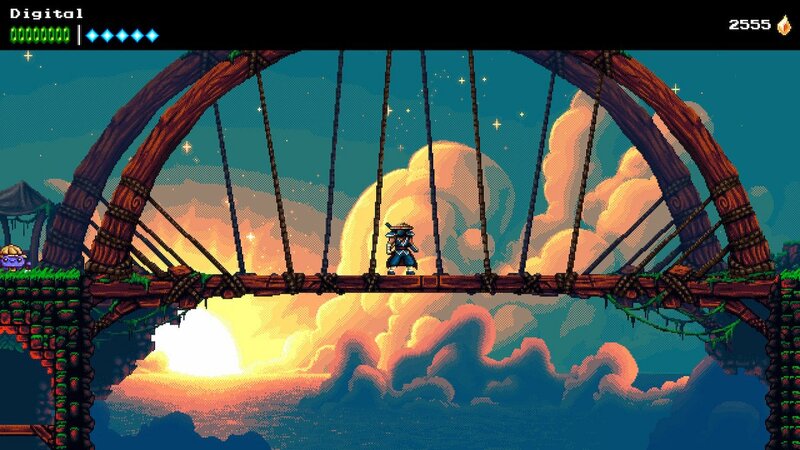 Even with its stellar gameplay, The Messenger’s graphics are one of its best features. During much of the game, you’ll enjoy perfectly retro 8-bit graphics, but around mid-game, stunning 16-bit graphics are featured quite prominently. As the graphical style shifts between 16-bit and 8-bit, the music shifts as well, with a basic chiptune soundtrack playing against 8-bit scenes and a fuller-sounding soundtrack playing when 16-bit graphics appear. The seamless shifts in visual and audio quality are delightful to experience, especially when the shifts prompt puzzle-solving and ingenuity from players. But don’t think that the 8-bit portions of the game are dull; they’re just a bit less vibrant than the 16-bit parts. An example of stunning graphical detail from a fully 16-bit scene. By the way—this game’s music is incredible! We’re also in love with The Messenger’s character design. Even minor characters are brilliantly designed, and witty dialogue brings each character to life. 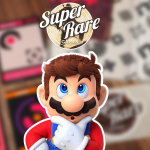 Much of the dialogue is laugh-out-loud funny, and we think most video game fans will understand the many jokes, allusions, and references embedded within this game’s superbly written dialogue. Even though you won’t hear any voice acting in The Messenger, you probably won’t miss it. 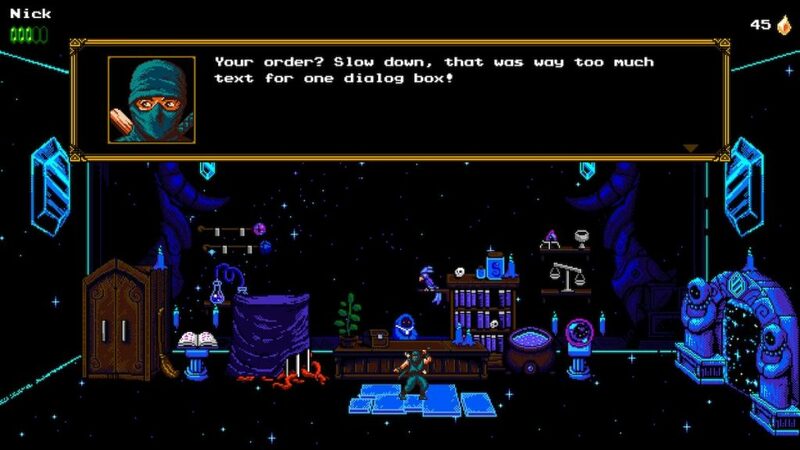 The shopkeeper’s hilarious dialogue is some of the game’s best. The shopkeeper can offer hints for a fee. 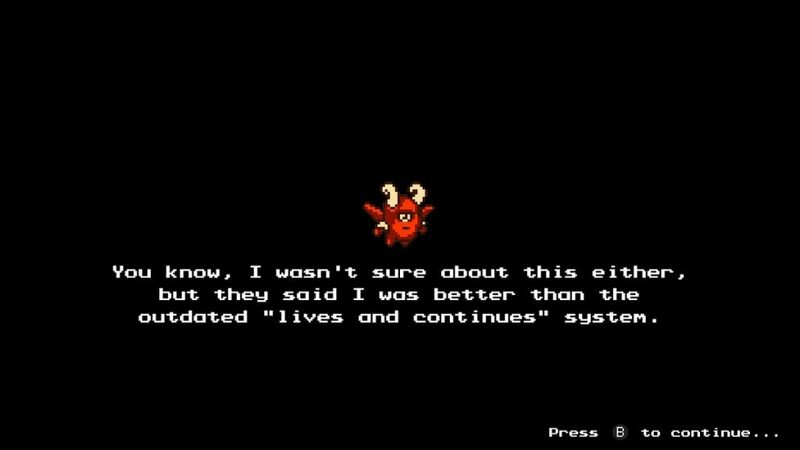 Get ready for at least 20 hours of gameplay if you plan on completing The Messenger at 100%, and understand that you’re in for quite a challenge, especially during the time-traveling portion of the game. 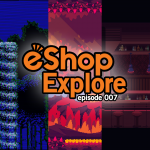 If you find yourself stuck and unsure where to go, the shopkeeper will help for a fee, marking where to go next. 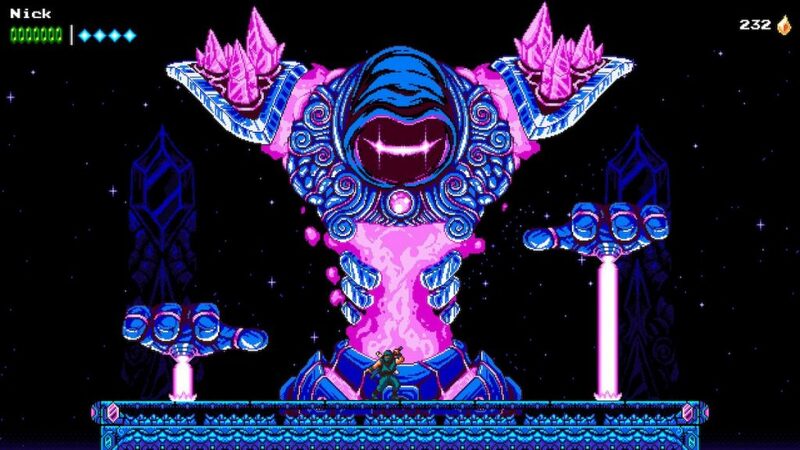 This helpful feature can be hard to come by in metroidvania titles, and it’s especially handy for less experienced players. And while boss fights can be tough, they’re incredibly enjoyable. In fact, we loved the boss fights so much that we’re hoping for a boss rush mode to be released in the future. Bosses are challenging, but we really enjoy fighting them! If you’re looking for a retro-inspired action platformer, The Messenger might become your new favorite game. 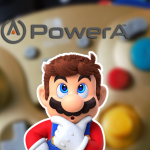 It’s a great pick for players of any skill level, and while inexperienced players may have some trouble with late-game platforming challenges, the game is forgiving enough for most players to get through with enough persistence. 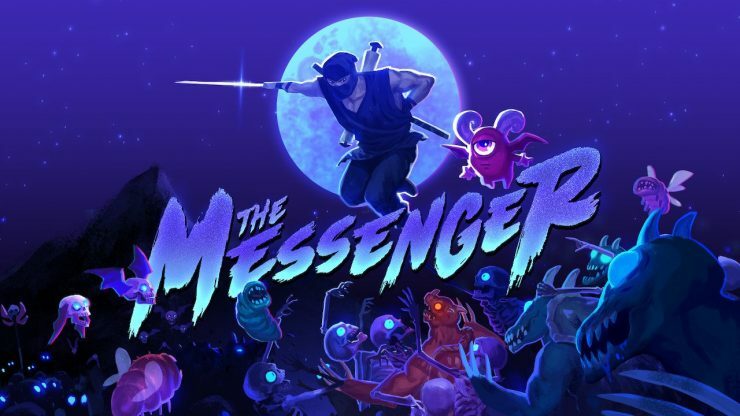 With excellent gameplay, a gripping story, gorgeous graphics, memorable characters, and more than 20 hours of gameplay, The Messenger is an exceptional Nintendeal and a must-buy for fans of retro-style platforming. We recommend giving The Messenger a shot when you can.